How often do you find yourself gazing up at the vast space above your head – that is, when there is no roof above you? If you are a frustrated astronomer, an astronomer in the making, or an armchair astronomer, here is an app that you will want to download NOW: Kepler Explorer. This iOS app – compatible with both the iPhone and the iPad – was released by OpenLab (University of California, Santa Cruz) in late March. The premise is simple: to offer anyone interested in astronomy the chance to experience the discoveries that have been made by NASA’s Kepler Mission. The Kepler Mission – NASA Discovery Mission #10 – is a quest to find habitable planets. I am not much of an astronomy fan, but reading about the Kepler Mission brought to mind the characters of Battlestar Galactica looking for a new home. While the need to find habitable planets may not be that urgent for mankind at this point in time, we never know when we will have to face that! Anyhow, for astronomy enthusiasts, the Kepler Explorer app will probably provide hours and hours of enchantment. 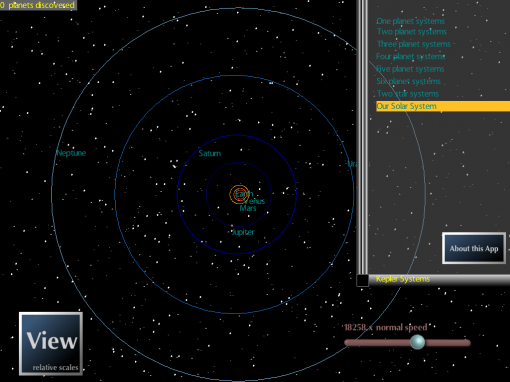 Check out this screencap of our solar system. You can zoom in and out to see the rest of the planets. 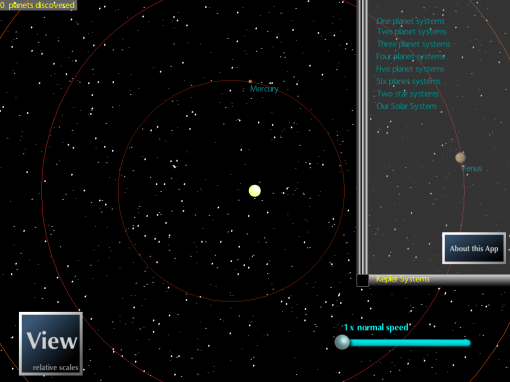 You can also increase and decrease the speed to observe the planets orbiting. Since this app is all about the findings of the Kepler Mission, there are also many other systems that can be explored. From one-planet systems to systems with lots of planets to systems with only stars – it’s like having a front seat ticket to the Kepler Mission! Interested? Get Kepler Explorer for the iPhone and iPad at the App Store for FREE.